How to write good meta descriptions and increase click through rates - Targeted SEO Ltd. If you are unfamiliar with meta descriptions and why they are important, then spend a few minutes reading this quick guide. Many website owners have terrible meta descriptions and really aren’t doing their business any favours in the search results. An optimised meta description can make the difference between a customer clicking on your website or visiting a competitor. A meta description is a 160 character snippet, used to summarise a web page’s content. A quick visit to Google for any given query and you will see meta descriptions in the search results. They are snippets of content up to 155-160 characters in length (sometimes longer) which summarise the content of the page and usually contain the keyword or phrase that best answer a user’s query. In December 2017 Google made an update to increase the characters in meta descriptions to 230 and many SEO’s jumped at the chance to re-write many of the descriptions on their websites, only for Google to backtrack and decrease a few months later… doh! It’s worth noting that Google will ignore the meta description if it feels there is a better answer to the search query on the target page and use this snippet instead. Does this mean meta descriptions are redundant? Not at this point. When creating your meta descriptions put the user first and not the search engine. Write a compelling description which will engage the user and encourage a click. The description should give a good indication as to what the website page is about, and what they will expect to see when clicking through. If the description is unrelated to the content Google will more than likely ignore your description and it will also result in a high bounce rate, as the user quickly backs out of your site. Use clear CTA’s (call to actions) to entice the user to click – Find out more! Meta description tags; while not important to search engine rankings; are extremely important in gaining user click-through from search engine result pages (SERPs). These short paragraphs are a webmasters opportunity to advertise content to searchers and let them know exactly what the given page has with regard to what they’re looking for. Meta descriptions can have a significant impact on search engine optimisation and can provide a great deal of value when worked on successfully. They should always be part of an SEO strategy and are one of the things I always develop for my clients. Is a meta description a ranking factor? No, and yes! Google doesn’t use them directly as ranking factors and they aren’t used in their ranking algorithms, so stuffing descriptions with keywords won’t help your rankings and will just look spammy. However, a well-crafted meta description can help increase click-through rates and as a result, increase traffic to your website. Clicks and traffic IS a signal to search engines that your website is a good match for a given query, and will help improve your position in the results. For e-commerce websites with 100’s of product pages, often with similar products, it can be extremely challenging create unique meta descriptions. In this case, it’s best to focus on the core pages (home, popular pages and category pages for example). Prioritise these over less important pages. Always include a clear call to action or value proposition such as ‘Buy Now’ or ‘As recommended by…’ to help increase conversion rates. Should you include keywords in your meta description? Yes, definitely. When a meta description includes the keywords and phrases that match the search query Google will bold them, this will help your meta description stand out and will also catch the eye of the searcher. How do you add a meta description to your website? There are many SEO plugins available for WordPress which will help you optimise your meta descriptions. One of the most widely used is ‘Yoast SEO’ which will also allow you to change the title description of the page (another opportunity to optimise for user and keywords) and the slug/URL. Yoast will also help you with the length of the description by displaying a handy bar which turns green to indicate the right length. Yoast SEO – the most widely used SEO plugin for WordPress. Another benefit to meta descriptions is creating structured data and rich snippets such as gold review stars in the search results. There is a way of providing search engines with even more information about your webpage using schema markup. Google won’t always display this but when it does, it can increase CTRs helping to drive even more traffic to your site. 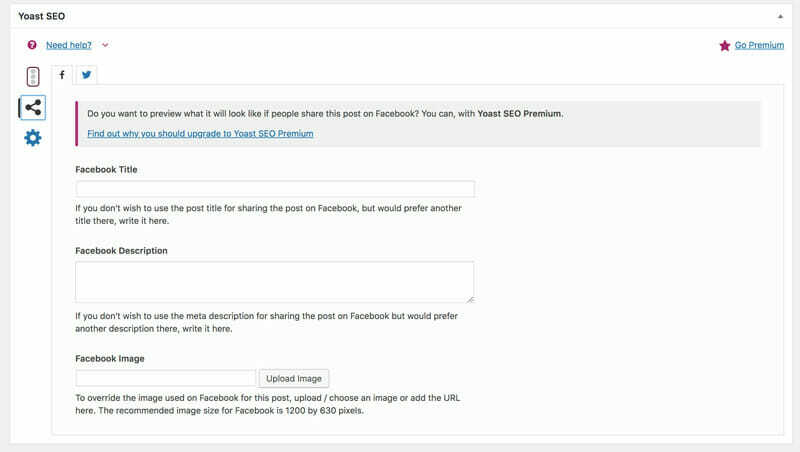 Use Yoast to create meta descriptions for social media channels. When your page URL is shared on social media channels such as Facebook, Google+ or LinkedIn, they will show the meta description on the post. You can change the content of this directly in Facebook etc but others won’t so it’s important your meta description is well written. If you’re using the Yoast plugin via WordPress as mentioned earlier, you can also add a custom image for each page which will display in the share. The description can also be customised for sharing on social channels. Creating your meta descriptions is just one small step on the way to optimising your website for search engines, but they can be very valuable for both visitors and customers. I recommend taking the time to work on your meta descriptions and page titles as it can make the difference between a sale or new enquiry to your business.